This year numerous objects from the archives of De Stijl-related architectural material are being lent to museums that are celebrating the centenary anniversary of De Stijl. 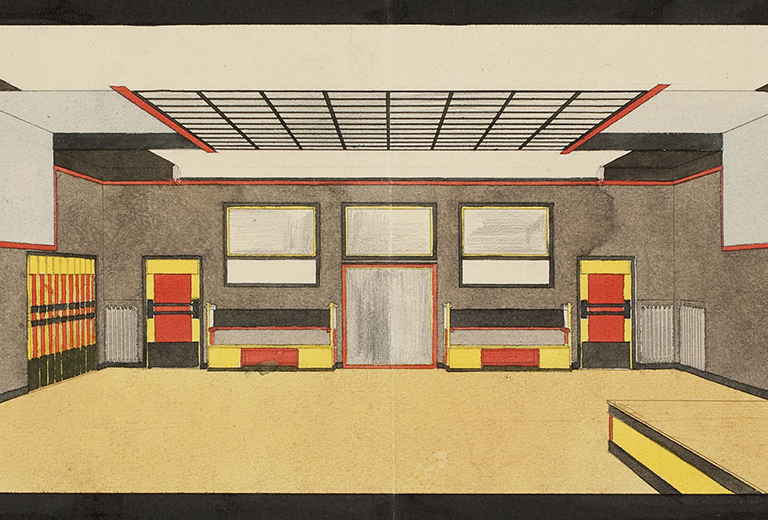 From 6 May, Kunsthal KAdE in Amersfoort presents more than 20 works from Het Nieuwe Instituut’s archive: drawings of aircraft interiors designed by Rietveld in the 1950s for KLM. Pronounced colours did not play a major role in Rietveld’s post-war designs, but he did return to bold colours for the airplane interiors. Rietveld had already been asked by airplane manufacturer Fokker to design an interior before, in 1955. Apparently, including an internationally renowned architect in the project fitted with their development of a modern, technically advanced plane. Rietveld in turn would use the constraints of an aircraft interior – basically an elongated tunnel with low lighting and immovable furniture – to try to create a sense of spaciousness by experimenting with colour. The designs for Fokker and KLM have a special place in Rietveld's oeuvre. Pronounced colours did not play a major role in his post-war designs. According to Rietveld, the last thing good architecture needed was the addition of colour, as it disturbed the experience of pure spatiality. In his designs, he mainly used light, spatial relationships and specific materials to create spaciousness. For the first time, in the airplane interiors, he used a bold colour palette. Not by literally reverting to the idiom of De Stijl, but as a further exploration of the ideas that were formulated within De Stijl regarding the use of colour and architecture. In the 1950s, attention to colour increased. Not only architects and designers but also industry and governments were interested in the functional and aesthetic integration of colour in the built environment, which would hopefully lead to improvements in physical and mental well-being. Another reason why Rietveld used colour here was mainly to enhance the time passengers spent on the plane. Fokker did not use his interiors in their fleet; instead they served as a kind of model interior for demonstration purposes. But it did result in a KLM commission for interiors for the Douglas DC-8 and the Lockheed Electra, and later for the Douglas DC7C. In 1952 KLM took a decisive step towards a unifying their corporate style. A good coherent design style would lead to wider recognition, but also to improvements in the service. The interiors of airplanes, buses, restaurants and booking offices had to be so stylish and atmospheric that pleasant spaces were created. Unlike Fokker, this KLM assignment involved an interior that would be produced in series and have to withstand intensive daily use. But it did not advance beyond sketches and suggestions. It is unclear whether of the designs that have been preserved were the final proposals or if they were ever presented to KLM. Although Rietveld made allowances for the intensive use of the interiors, the designs were not implemented, mainly for maintenance reasons. This text is based on the article ‘Kleur tussen Hemel en Aarde’ by Ludo van Halem in Jong Holland 1995(2), and ‘Kleur tegen saaiheid’, an article by Froukje van der Meulen, previously published in the journal Article. The exhibition The Colours of De Stijl in Kunsthal KAdE focuses on the use of colour by De Stijl artists and shows how in the decades after De Stijl, artists continued to research the autonomous power of colour: through abstract expressionism and concrete art in the 1960s and 1970s to contemporary artists who explore colour as an independent element. Kunsthal KAdE. Photo Mike Bink.